I saw the idea for these cute toilet paper roll rabbits on Pinterest. I just had to make them today’s craft with my 4 year old. 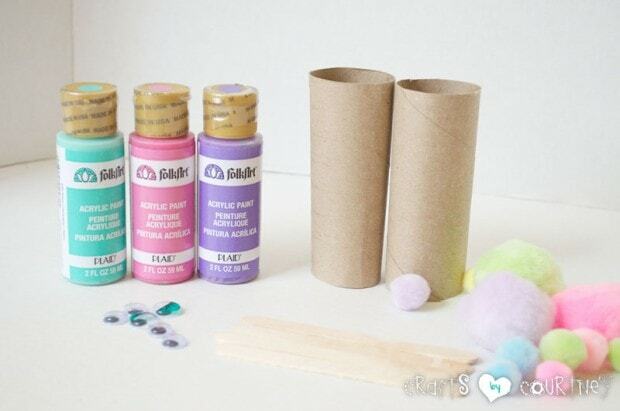 We love a toilet paper roll craft! I have a box full of toilet paper rolls in my garage. We really had a great time with this one. My little guy got pretty serious about making his rabbits. I was already stocked up on my supplies, but your local craft store or even Wal-Mart will have all the items you need. For the pom pom balls, I got a large bag of assorted ones at Michael’s. I used my “Handy Dandy” 40% off coupon of course. You know me and coupons, love that 40% off. I take all the kids with me when I go out because you can use a coupon for each person that’s with you at Michael’s. I had my son paint one coat on each rabbit and make sure he painted the inside of the toilet paper roll as well. I used popsicle sticks for the rabbits ears. I had my son paint a layer of white paint onto the popsicle sticks. While the white paint was still wet, we added some extra colors in the middle. My little guy dabbed on some glue and gently added his eyes. Mama took over with the whiskers and mouth part. I used some puffy paint I had to create my whiskers and mouth. Quick Tip: After you paint the mouth, DON’T sit them upright. My mouths started drooping and teeth got messed up. Once the puffy paint was dry, I went back over with my “Trusty” glue gun and added our rabbits ears, nose and bushy tails. I could have used regular glue but I love how the hot glue dries really fast. Aren’t these just the cutest rabbits you’ve ever seen? I don’t want to put them away after Easter. This was a craft we both worked on together, he totally could have done it by himself but I really wanted to try using the puffy paint with this one. 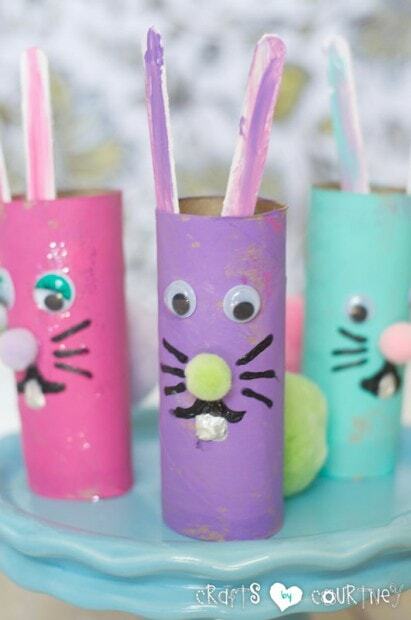 I hope you enjoyed our cute little toilet paper roll rabbits!